I downloaded each of these videos onto my computer and then put them on our iPod. I have a cable that I'll run from my iPod to the library's TV to view each of these videos. Hopefully it works!! Now, not techy? Neither am I - thanks hubby!! No problem. You can download and print flip charts for each of these songs from jollyjenn.com and simply bring the songs on CD (if you made a 2014 Primary Program Songs CD, your life will be that much easier!). I'd suggest placing each flip chart in plastic sheet protectors and putting them in a binder in order for easy flipping! It may be a lot of flip charts but if you plan on using them later in the year, you'll be saving yourself work later on, right? You can download the document HERE. I created another document HERE with songs #5 and #6 left blank so you can write in your own in case they are different than what I have. I understand that the little Jr. kiddos won't understand most of the worksheet but at least they will have something to color while we watch our videos ;). So, pass out a coloring utensil to all the kids, along with a worksheet and push "play." I'm going to encourage the kids to sing along as much as they can and if there are songs they don't know, they can go home and listen to their CD's that were given at Christmas. If you really want to go the extra mile, bring a movie treat! It should be a fun and simple way to introduce all the program songs for 2014 (as long as we don't have any technical difficulties)! Have any of you done this already? How did it go? Leave a comment if you will!! This is great! Thank you!! Can you give permission so I can edit your document. Then I can replace your 2 option songs, with the ones I'm doing? I make my documents using a Scrapbook software (MDS) so there's no way to make it editable unless you have the same software. I'd suggest literally cutting and pasting your own songs - type up your 2 songs, cut them out and tape them over what you need replaced. When you make photo copies, you'll never know it. I do it all the time. You could also send me a quick email using the "Contact Me" tab above with your 2 songs and I can change the document for you and email you a PDF back. I'll try to get it back asap but bear with me - I'm not fast these days as I just had my baby. Maybe I'll just post a document with the 2 "Your Choice" songs left blank so you can fill it in yourself. Sorry I'm not more help! ah!!! I'm so excited to try this. I kind of got thrown in as chorister and had hoped I could watch the previous chorister for a couple weeks to get an idea of her routine and that didn't happen. I'm so happy you're sharing your talents and ideas, this will be my second week and I used your ideas last week and they were great. Thanks again, I will follow your blog religiously until I figure out what I'm doing! We had a great review based on this pre-program idea and a couple other ones! Today we did "Primary's Got Talent". Divided into two teams (Primary met together and I had the whole hour). Primary Presidency were the judges, and gave each "performance" one, two, or three stars. 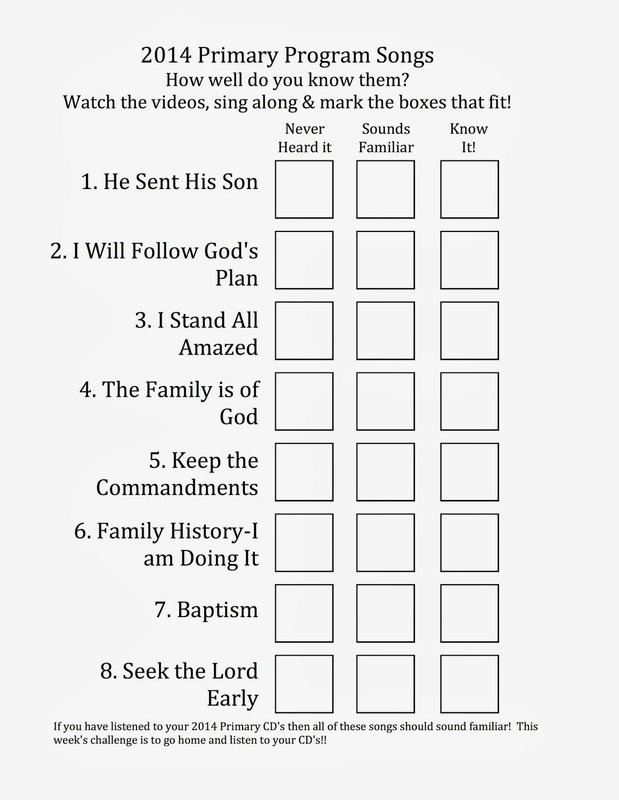 The "challenges" were Video Sing-Along using these videos, Dance Competition using the "Lap, Clap, Snap, Thumb" cards--I had an adult just change the cards and the kids had to keep singing while doing whichever action she was holding up, and "Costume Competition" using the OCD Chorister's mouth cut-out faces she did for Seek the Lord Early. (For that one, I had 4 kids from the team go to the front and lead their teams in singing using their best "singing mouth" voices. Each team competed separately and was scored separately. Points could be lost for irreverence, so none were lost! Because I was trying to do all 3 competitions on each song, I spent way too much time on the 1st song...I recommend picking a competition for each song, and then if you still have time, do a bonus round mixing it up. But it was a blast and very easy prep. Another wonderful Easter singing time activity from The Friend ! It's called The Miracle of Easter.